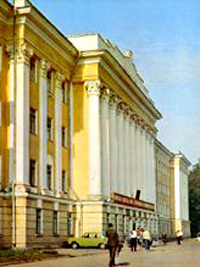 Moscow State Forest University - specialized establishment of higher education which trains engineering personnel, scientists as well as bachelors and masters for forest industry, wood processing and pulp-and-paper industry and is the major educational and scientific centre of forest complex of the country. Such famous scientists as O.Yj.Schmidt, V.N.Obraztsov, V.N.Sukatshev, N.P.Anuchin, S.S.Sobolev, A.C.Yablokov, P.P.Patsiora, B.M.Buglai, A.I.Vorontsov, P.S.Sergovskiy, B.A.Tauber, I.S.Melekhov, P.P.Aksenov worked in the University within these years. In our University all branches of forest complex are represented by different faculties. There are 330000 volumes of manuals and 211000 volumes of scientific books in the Universities' library.